The newly constructed Brown Station Elementary School in Gaithersburg, Maryland is officially open. The original Brown Station Elementary was constructed in 1979 and contained around 60,000 square feet. A space needs analysis, prepared by RRMM Lukmire, found that the school was undersized and outdated. 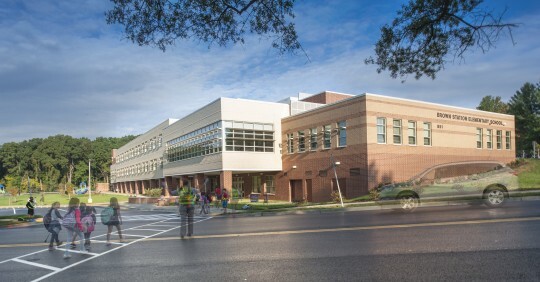 RRMM Lukmire worked closely with Montgomery County Public School’s planners to design a new, more efficient school to meet the educational specifications. To increase the square footage of the school without using too much space on the small site, RRMM Lukmire provided a series of two and three-story design options. The community and Montgomery County Public Schools chose the three-story school option to replace the existing school. The original building was demolished to make room for a new, 106,000 square feet school designed to hold 740 students. The design concept of the school is based off a train station with VTC flooring designed to look like a metro map. The inspiration comes from the nearby, historic Brown Train Station. It also contains a self-contained County daycare facility on site. The school includes a separated drop-off area and bus loop, parking, two softball fields, a soccer field, and four new hard and mulch play areas. This project also includes associated site work. The new building is designed to meet a LEED Gold Certification, which is pending. Sustainable features include geothermal wells that tap into the natural geothermal energy beneath the Earth’s crust as well as an abundance of windows to provide natural light. This design earned a Pilot Credit for interior lighting quality and a credit for low mercury fixtures. Maryland’s Montgomery County Public Schools is the largest school system in the state and the 17th largest in the U.S. It is a diverse district with students from more than 157 countries speaking 138 languages. MCPS was awarded a Malcolm Baldrige National Quality Award in 2010. For more information on Montgomery County Public Schools, please visit http://www.montgomeryschoolsmd.org/. RRMM Architects is an award-winning, full-service architecture, planning and interior design firm in Chesapeake, Virginia with offices in Richmond, Roanoke and Arlington. Founded in 1988, the firm was recognized by Virginia Business Magazine as the largest architecture-based firm in the Commonwealth of Virginia. RRMM is committed to client success and to their mission of creating great places to live, work, play and learn. RRMM Lukmire is the new entity created in 2016 by the merger of RRMM Architects and The Lukmire Partnership Architects, which had both been in the business for over 28 years. Staff from The Lukmire Partnership continue to serve clients in the Mid-Atlantic region but with increased support and experience from other offices when needed. For more information on RRMM Architects, please visit www.rrmm.com.